"We have a stew in Peru called seco, made with beef or lamb, yellow chiles and lots of cilantro," says Schiaffino. 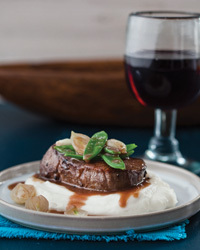 The dish prompted him to make a wine sauce with cilantro, which he serves with beef tenderloin. Porchetta, a traditional Italian street food, is a moist and fatty fresh ham covered with skin that's heavily seasoned with salty garlic, rosemary, fennel and lemon. Chef James Lewis of Bettola in Birmingham, Alabama, adds some heat to his version with crushed red pepper.